We can choose to live green in many aspects of our lives, today we’ll learn a bit more about a term called greenercising. Enjoy the outdoors. 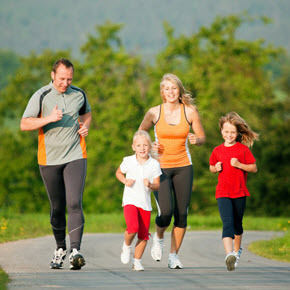 Why not lace up a pair of running shoes and hit the pavement or trails for a nice walk, hike or run? There is nothing more green than spending time outside and breathing in the wonderful fresh air and enjoying the scenery. You can even do some interval training like lunges, squats, push-ups or hit your local park and play around on the monkey bars and park benches for a nice “this is what it feels like to be a kid again” workout! You would be surprised how good of a workout you can get with a park bench and some sand filled juice jugs! Make the gym a green experience. We know it may not be realistic to workout at home, so why not try to green your workout at the gym. If you feel like jumping on the treadmill set it at a high incline as to use less energy. Turn the TV off if no one is watching! If you also belong to a gym, try walking or biking to the gym instead of driving. Wear green. Everyone feels better and ready to tackle working out with a new outfit, but this doesn’t mean it has to hurt the environment. Trying buy clothing made from organic and/or recycled materials, but if the price tag is too hefty, second-hand could always be an option. You might find some great finds at a thrift store. There are many companies such as Patagonia that offer running shoes made with recycled materials and truly try to make a difference with their sustainable practices. Eco-friendly gear. You obviously need a bicycle to bike, and a yoga mat for yoga. There are many green options available; you just might have to look a little harder. PVC-free yoga mats are a great option and buying second-hand will lessen your impact on the environment. There are many websites that sell used exercise equipment such as bikes, and weights. Bring your own bottle. Millions of plastic water bottles are disposed of in landfills every year. There is no need to buy a new bottle every time you workout. Just have yours ready to be refilled at the gym or at home. Information shared from this great resource. The View at Long Lake has Reached Full Occupancy!